rec. 2009 (?) Spanish organ of St Lambert, Woluwé-Saint-Lambert, Brussels, Belgium. DDD. The title of this CD is something of a misnomer, since only three of its 14 tracks are battle-inspired. Otherwise, it will be pretty well self-recommending to lovers of baroque organ music and fans of Ton Koopman, two almost synonymous groups. 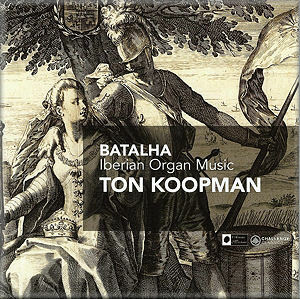 As you might expect from Koopman, those three Batalhas come over really powerfully, so it’s perhaps not such a misnomer after all. One of these colourful pieces is anonymous; the other two might just as well be, since very little is known about their Portuguese composers, Antonio Braga, who seems to have been named after the city where he was based, and Pedro de Araújo, the latter not to be confused with his Spanish near-namesake who also features here, Francisco Correa de Arauxo. The programme centres on one of these Batalhas and is book-ended by the others. Depictions of battles in music were by no means uncommon from the renaissance onwards. Later composers, of course, have written music descriptive of or suggested by battles, from Beethoven’s Wellington’s Victory to Britten’s War Requiem, but the genre is especially associated with the renaissance. Guerrero even composed a mass, Missa de la batalla escoutez, based on Jannequin’s piece la Bataille, so popular was it. The Hyperion recording of Guerrero’s Mass has just been reissued on the budget price Helios label (CDH55340 – see review and my October, 2009, Download Roundup), a most recommendable recording, but it’s fair to say that the three battle pieces here are more immediately exciting. I had not come across any of them before and I’m grateful to Ton Koopman and his Challenge Classics label for introducing them to me. Indeed, very little of the music here is well known. There are other exciting pieces, too, but there are also some quieter, more reflective items, such as Bruna’s Tiento sobre la letania de la Virgen, which follows the introductory Braga Batalha (tracks 1 and 2) and Coelho’s four tentos on the song Suzanne un jour, which immediately follows the central Batalha, on tracks 6 and 7. (Tiento and tento are Spanish and Portuguese respectively for a type of Iberian music related to the fantasia). In fact, the programme is fairly evenly divided between the extrovert and the reflective. Both types of piece are well suited to the organ and both receive excellent performances from Koopman. It’s no surprise to anyone who has witnessed him in action that he belts out the battle pieces and the other brisk works with real gusto, but he is also more than capable of doing justice to the quieter pieces. The organ of St Lambert in a suburb of Brussels is far from an ordinary Flemish instrument, as its name, the Spanish Organ, makes clear. Built by Patrick Collon in 1985, its design was largely inspired by Spanish organs of the 17th and 18th centuries with their distinctive trumpets and other wind stops. The specification of the single-manual St Lambert instrument is given in the booklet and it turns out to be a most appropriate vehicle for the music and in better tune than many Iberian instruments. The only thing missing is the registration for each piece, which it would have been good to have. It would have been good, too, to have been given the recording dates; if they are here, I couldn’t find them in the booklet or on the website. With excellent recording, coping equally well with the extrovert pieces and the more reflective works, and informative notes by Ton Koopman, well translated, this CD provided me with 77 minutes of real enjoyment. Whether it will appeal quite as much to the general listener with less specialist interest in renaissance and baroque organ music is another matter; I should like to think that it would. Those who find themselves attracted to what they hear and wish to explore further should try the six concertos for two organs by Antonio Soler; will Decca or, better still, Eloquence, please restore the recording of these by Peter Hurford and Thomas Trotter in Salamanca Cathedral, last seen on 436 115-2, to the catalogue? Even the extract on The Art of Peter Hurford (475 6828) seems to have been deleted, though that 2-CD album remains available from passionato.com as an mp3 download.